This slow baking process creates superior durability without compromising the aesthetic appearance of the planter. The continual biaxial rotation of the mold during the fusion process internally strengthens even the deepest corners and crevices through additional distribution of the polymer resin. 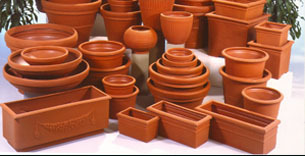 Planter products 2D and 3D drawings. Virtually indestructible, Armeria's products are rotationally molded. This slow baking process creates superior durability without compromising the aesthetic appearance. 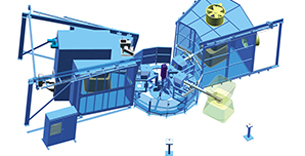 The continual biaxial rotation of the mold during the fusion process internally strengthens even the deepest corners and crevices through additional distribution of the polymer resin. Once a finite history has been reached, a mixture of recycled water spray and cool air surrounds the mold until the planter solidifies. Best of all, this low-pressure process allows for unlimited design possibilities along with an unequaled combination of light weight strength and beauty. Rotational molding is a plastics processing technique that is feasibly suited to produce hollow, seamless parts which are partially or totally enclosed. Designers utilize the rotational molding process to produce small or large parts of unusual shapes due to rotational molding's ability to create strong one-piece parts. There are unlimited possibilities when considering the rotational molding process from a designer's perspective, since parts as small as a golf ball or as large as a 6500 gallon containment vessel can be made via rotational molding. Rotational molding even has the ability to produce large or complex parts on short notice due to its low pressure process. The minimal strength required from the rotomolds also offers low tooling costs. Both these low costs and durable parts make rotational molding suitable to produce prototypes as well as small or large quantities of production parts. The low pressure processing involved in rotationally molding a plastic part has the added benefit of producing parts which are relatively stress-free, compared to the injection molding, blow molding, or thermoforming processes. This advantage is especially important when considering large, load-bearing plastic components in applications which involve corrosion or require stress crack resistance. Theoretically, all thermoplastics can be rotationally molded. The most commonly rotationally molded plastics are polyethylene plastic, polyvinyl chloride, nylon, and polycarbonate. The rotational molding process begins with a premeasured amount of plastic resin material in powder or liquid form placed in a mold cavity. The mold is then tightly closed. The rotational molding machine then indexes the mold into the heating chamber of the oven where the mold and the plastic are brought up to molten temperature. The roto-mold rotates continuously about its vertical and horizontal axes while it is heated, creating a puddle of molten plastic material. This biaxial rotation brings all surfaces of the mold into contact with the melted plastic material. The mold constantly rotates inside the oven until all the plastic material adheres to the hot inside surfaces of the mold's cavity allowing the plastic material to densify into a uniform layer of melt. While continuing to rotate, the machine indexes the mold out of the oven and into a cooling chamber. Air, or a mixture of air and water, cools the mold, which maintains the form of the interior layer of molten plastic material. This cooling process continues until the part has cooled adequately to retain the mold's shape. The machine then indexes the mold to the loading and unloading station. The molded part is removed, and a new batch of material is then placed in the cavity of the mold. The mold closes once again and the process repeats. Relative to their size, rotationally molded parts can have thinner walls than smaller parts made by other processes. The inherent process of rotational molding tends to produce an increasing wall thickness on outside corners of parts, which gives the rotational molding process a distinct advantage over blow molding and thermoforming since these processes tend to produce thin outside corners. The added thickness and corresponding increase in strength at the outside corners especially benefits large parts. Armeria's Classic Lighting polysteel posts is a three part material which includes a steel pipe, durable plastic exterior and structural foam. Polysteel provides the same decorative detain and appearance of cast iron for a fraction of the cost. 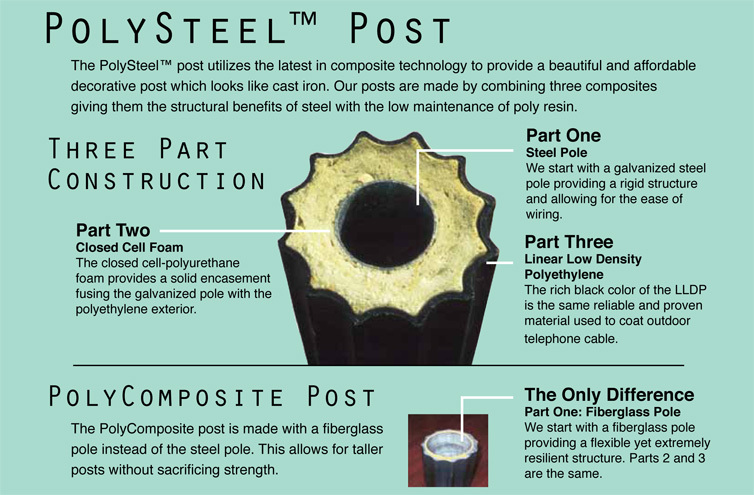 Polysteel posts are structurally rigid yet lightweight and easy to handle during installation. Classic Lighting offers reproductions of turn of the century lamp posts.